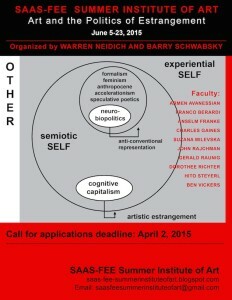 The SAAS-FEE Summer Institute of Art is calling for applicants to enter work for Art and the Politics of Estrangement. Art and the Politics of Estrangement, this year’s Saas-Fee Summer Institute of Art, engages a range of contemporary discourses to renegotiate a seminal idea formulated in high modernism, ostraniene or estrangement: the process or act of endowing an object or image with strangeness by removing it from the network of conventional formulaic, stereotypical perceptions and linguistic expressions. Times have changed since the term’s coinage, and so has the surrounding discursive environment. What are the implications for artistic ostraniene today? For instance, in the networked environment of “super signifiers” and branded associations, can we still contravene in the stereotypical perceptions they engender ? If so, would that be a form of emancipation in which artistic production can play a role, or is it trapped in the new spirit of capitalism and its cycles of recuperation? 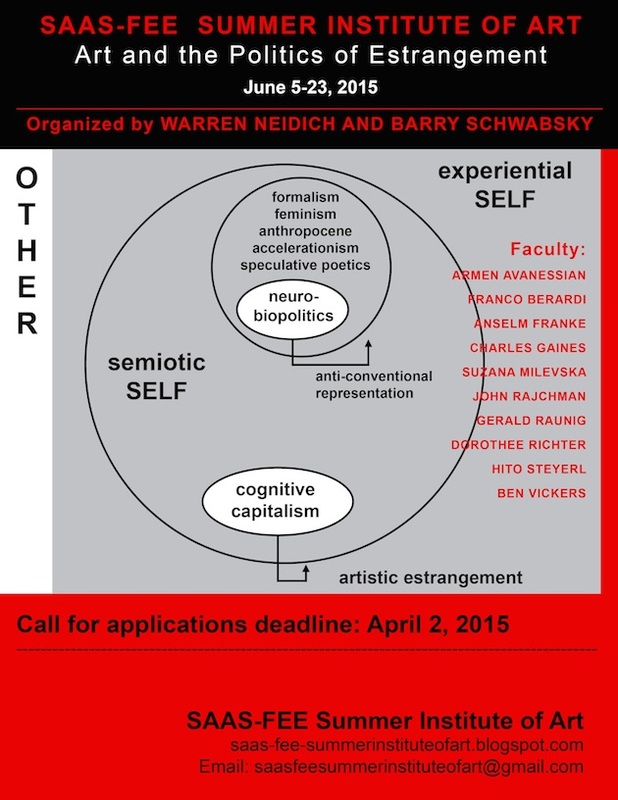 The Summer Institute uses the term estrangement as a foundation on which to collage a multiplicity of contemporary metaphysical and epistemological practices and terminologies: the Anthropocene, Speculative Poetics, Cognitive Capitalism, Accelerations–can any of them help find an answer to the question of estrangement? For art students and recent graduates seeking a deeper theoretical understanding of their practice, or for those in the fields of critical theory, philosophy, politics, neuroscience, and media and literary theory who aspire to challenge their presuppositions, this course will provide a theoretical bridge to these important emerging discourses. Twenty students will be selected to attend the school. Applications will be assessed by members of the Faculty. Two scholarships will be available for students with special needs.